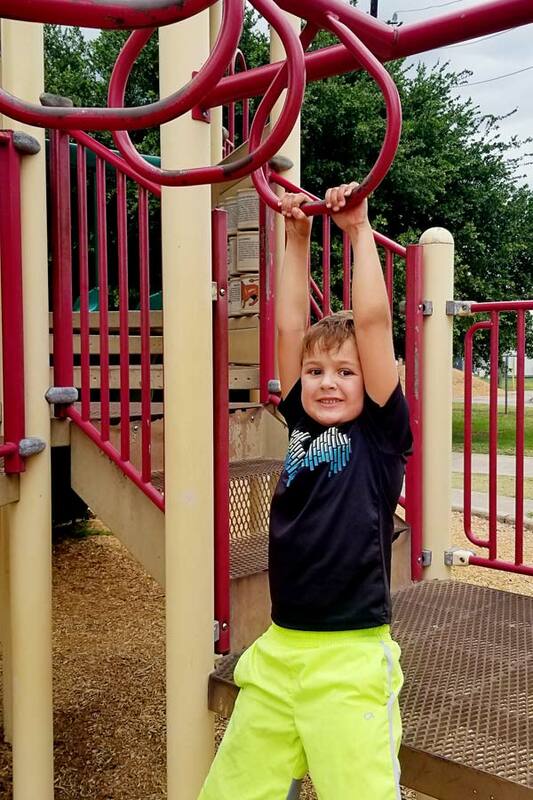 Bane Park: Family Fun in Fairbanks! Bane Park, Something for Everyone! Bane Park was named for the gentleman who donate the land, W.L. “Bill” Bane, Sr. He was active in the Fairbanks community� for years by establishing it’s first bank, Fairbanks Bank (now a Wells Fargo) and a member-owner of the Cy-Fair Gun Club (formerly Tin Hall). It is located off Highway 290 at the intersection of Gessner & West Little York Rd, in a commercial area. Honestly, it is not the prettiest drive in but it is a great park! 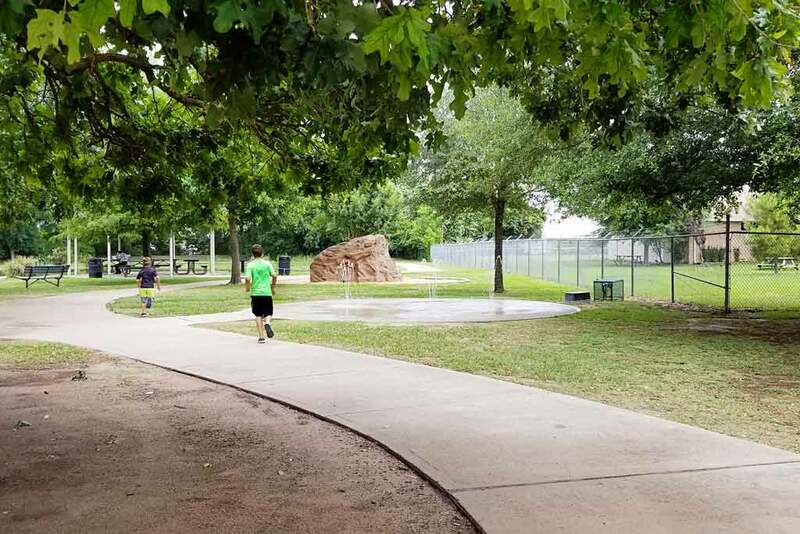 The park shares the parking lot with Lions Club Cy-Fair Lions Park baseball fields (though�Cy-Fair Sports Association uses the ones in the park complex too) and, on the corner, is the Fairbanks Library, a branch of the Harris County Public Libraries. We ended up there on a day when we were dodging thunderstorms so there were very few people about. Though the lot is large if you went on a weekend with baseball games I could see parking being a bit of a pain.� In general though the lot is a ample sized and there is an overflow dirt lot available off West Little York. 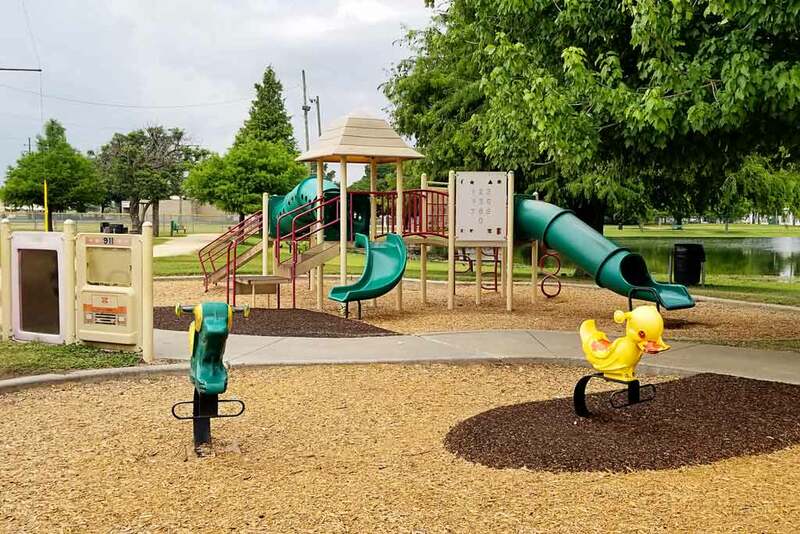 The park has so many amenities that everyone in the family should be able to find something to do.� There are two play structures, a larger and smaller, plus swings!�� Just as you enter the park, to the left, are bathroom facilities.� If you continue down that path you will also find the sand volleyball court & horsehoe pits. 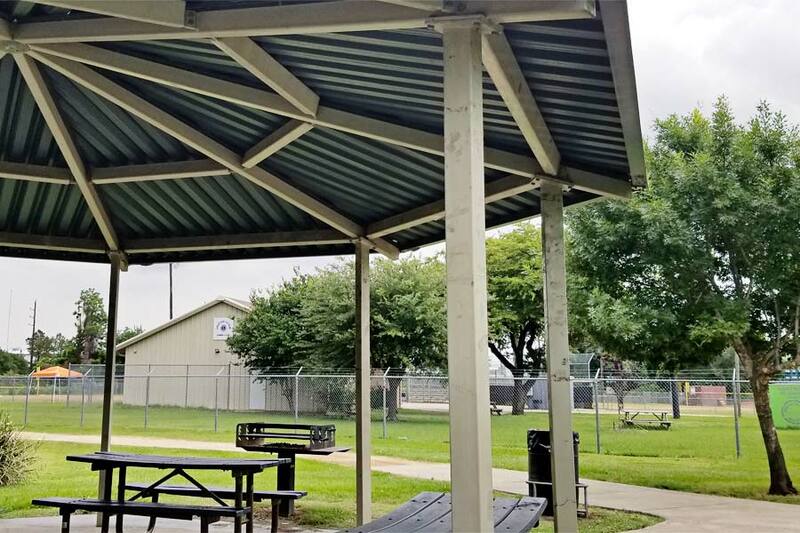 Like many county parks there are pavilions but they are first come first serve.� In addition, there are park benches and tables with charcoal grills available. 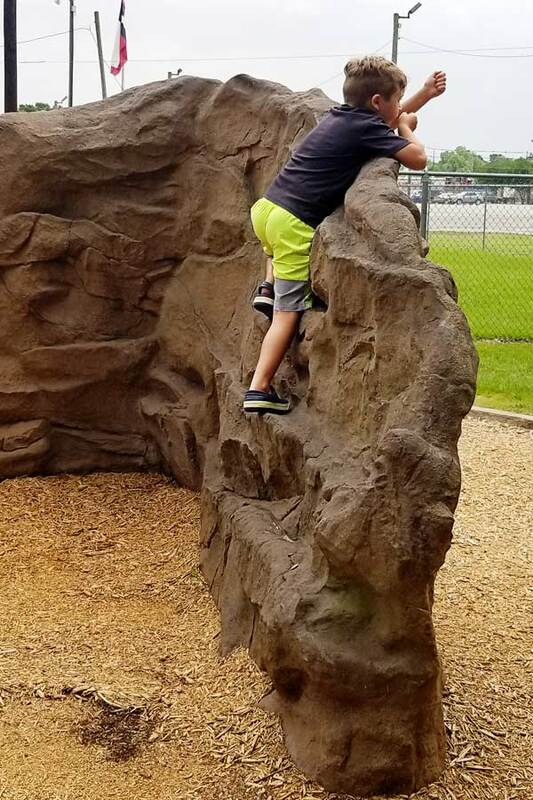 If you follow the path to the right there is a splash pad and rock wall climbing structure.� The splash pad has a touch sensor to activate it and the rock wall is just that…and, my kids loved it! The lake is stocked yearly with rainbow trout and is also home to large mouth bass and channel catfish.� Catch and release is encouraged )and required for the bass) and those over age 17 need to have a Hunting and Fishing License, including fresh water.� The lake is for fishing only – no swimming or boating allowed. There are other wildlife. We saw egrets, ducks, and nutria (can you spot the large water rat in the photo below?!). There is a paved walking trail around the like and some unpaved trails toward the back of the park. Along the trail are several signs to help identify the local flora (and, many are Pokestops). 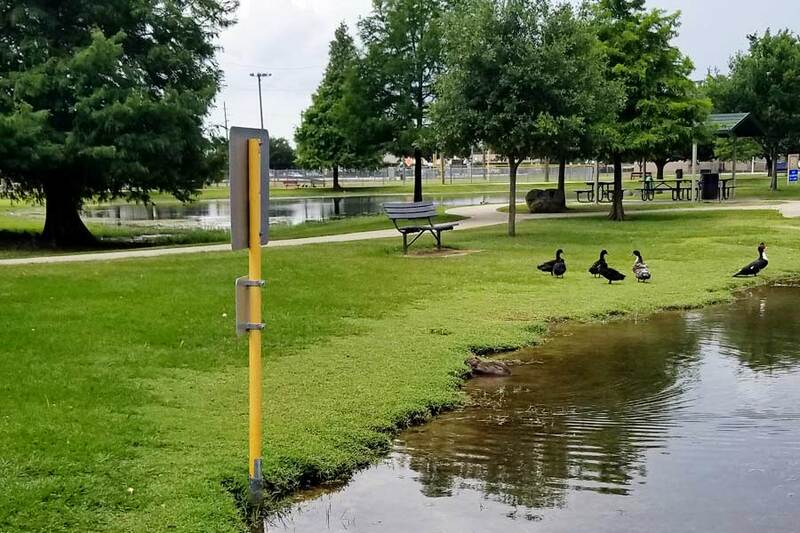 The park is open M-F 7 a.m. – 10 p.m. and Sa & Sun 8 a.m. – 10 p.m.
Just down the road is the Harris County Household Hazardous Wastes station where you can turn in items like paints, batteries, items containing mercury, aerosols, and fluorescent tubes.� It is free for all Harris county residents, so if you are heading to the park bring along that random bag of dead batteries to make sure they get disposed of properly!� They are open to the public Wednesdays from 9 a.m. – 3 p.m. & second and fourth Sa & Su form 9 a.m. – 2 p.m.
Next Post: Greatest Recycling Project Ever! Houston’s Beer Can House!